Following the belief that you always remember where you were when you heard horrible news, I am remembering where I was 30 years ago - January 28, 1986 - when the U.S. Space Shuttle Challenger exploded in the sky a few minutes following takeoff. 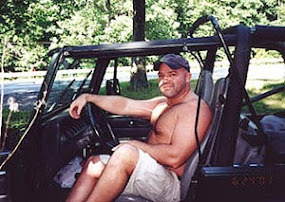 I was in my car - my first car - driving to the beach. My goal was to get a job for the summer, so I drove down for some interviews. It had snowed a few days before, but the roads were clear and wet. Dirty water would spray lightly on my windshield and would streak across the glass when I turned on the wipers because my 1979 blue Chevy Chevette was out of washer fluid. Occasionally I would stop at a fast-food restaurant and get a cup of water to throw on my windshield during the trip. I was on Route 50 heading east, near Salem, MD when I first heard the news on the radio sometime before noon. Music stopped that day and the radio was filled with reporters regurgitating the same news over and over, just like they do today when a disaster happens; "experts" trying to make sense of the senseless, explaining their points of view as to what could have happened; it would be weeks before we actually would know. Six astronauts and 1 teacher died that day, and the teacher's family, students, school district, and many others watched the explosion happen in real time. I got to Ocean City and had my interview, and I remember talking to my interviewers about what I had heard. I checked in to the Quality Inn Hotel on 17th Street & the Boardwalk. I had always wanted to see what that place was like because it looked so nice. We used to go down to Ocean City every summer and would stay on the bay side up around 30th Street. The Quality Inn was the only high rise at the time and it was right on the beach. So I treated myself and got a room on a top floor overlooking the winter ocean. For the rest of the night, I sat in the room with the lights off and the TV on, watching the coverage of what had occurred earlier in the day. I kept the balcony drapes open so I could occasionally look up to see the moon shining on the sea. I ordered a pizza and just watched the news the rest of the night - watching the moment of the explosion time and time and time again. The media had been everywhere during takeoff because they wanted to capture the emotions of the teacher's family and students as she lifted into space. So the news replayed the expressions of wonder, then confusion, then horror on the faces of those who knew her and the others. It was gut-wrenching, but I watched because I grieved for them - part morbid curiosity, part trying to understand what happened myself. The following morning, I drove back to Frostburg. I got the job I went after and would move back down to the beach a few months later. And I eventually added washer fluid to my car. But I would always remember where I was when I heard the news about the Challenger exploding. Since I turn 50 in the next few months, I feel that I am now old enough to use the term "back in my day". I mean, if I am old enough to be a member of AARP, then I have the right to wax sentimental about the days of my youth. As folks along the east coast dig themselves out from under Winter Storm Jonas, I thought about how the winters have changed since I was a kid. Back in my day, as I remember it, we didn't have occasional snowstorms that would occur sporadically throughout winter; it would start snowing sometime after Thanksgiving and would continue - for the most part - until March. There always seemed to be snow on the ground. There never seemed to be snow, then melting, then nothing, then snow again, like there is now. It used to snow big time. And now when it snows, it's big time news. I remember Mom putting plastic bread bags on our feet before putting our boots on. Whether just walking out to the bus or (eventually) walking to school or playing outside, those damn plastic bags had to go on our feet, regardless. I remember the ridiculous amount of time it took to get ready before going out sledding or to play in the snow: full snowsuit, boots, hat, gloves, muffler, scarf, and several layers of clothes. You built up a sweat before even stepping outside. It became almost impossible to move in that outfit. Once you fell on the snow, it might take 10 minutes to get back up. I remember the hats my Grandmother would crochet for us every few years. They were made from very thick yard and, man, were they warm! It's missing it's original puffy ball on top, but I still have the one she made me in 1976. It was red, white, and blue, as was just about everything that year due to the bicentennial. I still wear it on really cold days. I haven't found anything the keeps my head as warm. As you can see, Kevin gets a kick out of it. I remember walking across the alley and sledding down Carters' hill. We used cardboard boxes, inner tubes, and wooden tobaggans before plastic sleds were created. The goal was to get as far down into Bowser's yard as possible, disregarding the fact that it would be a really loooong, exhausting walk back up to the top of Carters' hill. The fun typically ended when someone started crying, either due to snow in the face or just being too cold to continue. It was the signal that we had been outside too long and it was time to go back in. I remember shoveling out the driveway . . . A LOT, then hiking over to Granny's house to shovel her sidewalk. I remember a night when we went to Granny's, and my relatives and neighbors were already there sledding down the hill on her road - at night, running into parked cars and bushes and fences. Night time was always the best sledding time. And then we piled into Granny's house for homemade ice cream with Grape Nuts. Nothing worse than when your insides are as cold as your outsides, but it sure was nice. I don't actually know how correct I am about all this, but this is how I remember winters: consistent snow from December to March with no real breaks. If that is so, I imagine it was perhaps harder then, but for some reason it seems simpler. On a recent trip to NYC, I managed to get a drive-by hug from my dear college friend, Kathy, who was understudy swing for the Broadway production of A Gentleman's Guide to Love and Murder. It was beyond lovely to see her and talk with her again after several years. Despite chatting now and then on Facebook, I did the math and realized to my horror that I had not actually seen Kathy in about 18 years. Before NYC, the last time I saw Kathy was back in 1998 when I was visiting Chicago from DC and she was performing in the Chicago production of "She Loves Me" or "Crazy For You" or something like that. No doubt she was fabulous in whatever it was. It felt sooo good to see her and reconnect with her that I made a new year's resolution that during 2016 I will try to reconnect in person with as many of my old college friends as possible. It's totally doable, provided of course that they want to see me too. Fingers crossed. I'll admit here that I am not the best person in the world when it comes to staying in touch with people. I think I used to be once because there are entries in my old calendars regarding letters and cards I'd sent to people. But over time, cherished friendships faded away, in part because I did not hold up my part of the bargain. I've placed blame on geography and schedule, but the truth is I just didn't work hard enough. I'm not saying it's completely my fault that my old friendships have faded away, but I will take my share of responsibility. Some of it possibly stems from my introvert tendencies, while still the ugly feelings of insecurity creep into play. Being somewhat of a stable force in my 20s and 30s, I had attracted mostly artistic, creative, genius dreamers as my friends, all of whom had gone on to fulfill their passions and have amazing lives and careers while I had remained somewhat constant and, by comparison, boring and predictable. I would have nothing to contribute to conversations when asked, "what's new?" or "what have you been up to?" As mentioned before in this blog, it was one of the reasons I wanted to leave DC back in 2005. When asked, "what are your hobbies? ", I simply had no response. All this changed, of course, once I met Kevin. Because not only is he the most interesting person I know, he takes me along on his adventures, either physically or spiritually. And I would love for my old friends to meet him, just as I want to meet the people with whom they are now sharing their lives as well. So, look out gang - I'm coming (back) for you. My goal is to add an updated photo next to the last one we had taken. I hope we get to spend some time together, reconnecting and reminiscing. You were the most important people in my life for 4+ years, and I want you back. 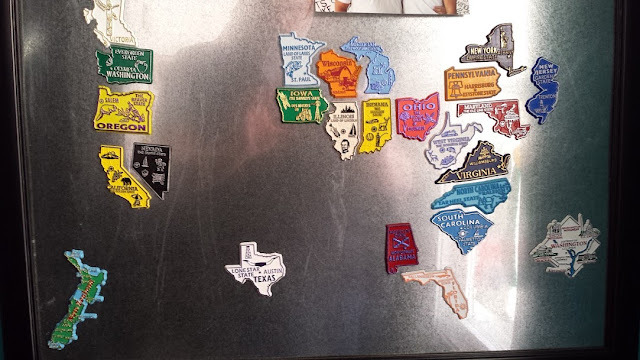 A few years ago, Kevin and I began collecting magnets for the US States we visit together. It's been fun for us to be able to see where we've been together and where we still need to go, all in one look. We don't collect just any magnet. Our preference is the ones put out by MGI Companies. Our collection is current (Alaska is just out of the shot in the upper left corner) with two exceptions: during our recent Christmas trip back east, we passed through Delaware (which has been ordered), and the New Zealand magnet in the lower left was brought back to me when Kevin and Matty spent two weeks in a van traveling around the north and south islands. We even have a magnet for British Colombia, Canada which we visited during our Alaska cruise in 2013, as well as magnets for all the countries we visited when we were in Europe in October. As you can see, we will need to hit New England and most of the center of the U.S. (or as people-who-don't-live-here call it, The Heart Land).